Great for legal departments of large corporations, law libraries, legal firms and government agencies, these collated alpha tabs make documenting easy. • Each bank contains 26 tabs with letters from A-Z. 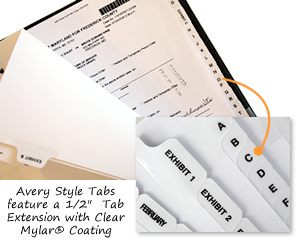 • We also offer hole-punched and tabs with Mylar edges. • Avery style letters are the most common and great for easy viewing. The tabs are of excellent quality and weight. Really like that the left side is left blank for any type of binding we may want to choose. You will find the tabs from Xpress to be of great value. Xpress Tabs delivered in a very timely manner. We will purchase additional tabs in the future!